I picked up these chips at the Wholefoods in Chicago when I was there in November of last year. Yes, I know that was months ago but it has taken me this long to blog about them. I had a reader nudge me to write as she is hooked on Coriander Kitchen and missing my regular posts. This is for her. Well these chips caught my attention as I had not seen these flavours before. Both these flavours seem very Canadian as we are know for our bacon and as being beer drinkers. The chips taste quite opposite on the palate. The maple bacon was sweet and the cheddar beer savoury. The maple bacon has a strong bacon flavour and the cheddar beer has a prominent taste of hops. It essentially tastes like a beer burp. I’ve since seen the maple bacon in stores in Vancouver but the cheddar beer is still to come. I wonder if beer flavoured items are not allowed here. My son preferred the cheddar beer flavoured chips, where my daughter liked the maple bacon better. I couldn’t decided which I liked better and found both equally good. You can buy the maple bacon chips are natural foods stores and where you buy Kettle Chips. 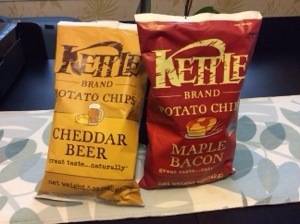 You are currently reading Cheddar Beer and Maple Bacon Kettle Chips at Coriander Kitchen.